Great Publishing: What Is Its True product? And, have publishers lost sight of it? Can Jeff Bezos, who just bought The Washington Post, eighty years owned by one of America’s great publishing dynasties: the Graham family, redefine the newspaper publishing business and reintroduce the true publishing product? Given his success in redefining the book selling and publishing arena — I would lay odds on his success. The Graham family ran the paper with dignity, grace and a commitment to public service — but, time had passed them by. In the past newspaper world they always kept the business side of the biz separate from the editorial side; this served the industry well, insulating journalists from pressures that would undermine their objectivity — But, as financial pressures came to the fore and the cult of shareholder value took hold—a notion increasingly becoming known as the dumbest idea in the world—publishers lost sight of the true purpose of the industry—to inform, excite and inspire. Also, in 1989 a lone revolutionary working at the CERN laboratory in Switzerland named Tim Berners-Lee wanted to free content from the confines of technology platforms. He built a World Wide Web on which access became universal and distribution free. So, how does all this tie together to give us publishing’s true product — mainly, content that attracts distribution? Bezos interested in much more than just Amazon! I suspect that Mr. Bezos might have a nostalgic soft spot, as do I, for the dynamic, constant deadline publishing style of newspaper journalism; but, his interest in a print newspaper probably goes to a higher motive than just nostalgia. He does want to become a big media player as evidenced by his current involvement in streaming movies available to its Prime members in an ongoing competition with Netflix — and Bezos’ Kindle has been delivering videos, music, news and books; a media-consuming tablet put in-place to push device sales. BUT, can he save a print industry plagued by declining print advertising sales? OR is he going to redefine that revenue source with something entirely different (imagination needed here)? Remains to be seen. Don’t forget, though, that Bezos is somewhat of an advertising guru himself — just look at the money he attracts with Amazon (which is detailed and tracked more by eMarketer in tonight’s feature news article drawn from USA Today). He is also interested and has ambitions in many things outside of Amazon, retailing and books. Bezos is still heavily involved in his 2000 startup, Blue Origin, which intends to provide a human spaceflight company for space exploration — with a goal of developing space hotels, amusement parks and colonies for several million people orbiting the Earth. Amazon’s Bezos: Retail revolutionary, news tycoon? 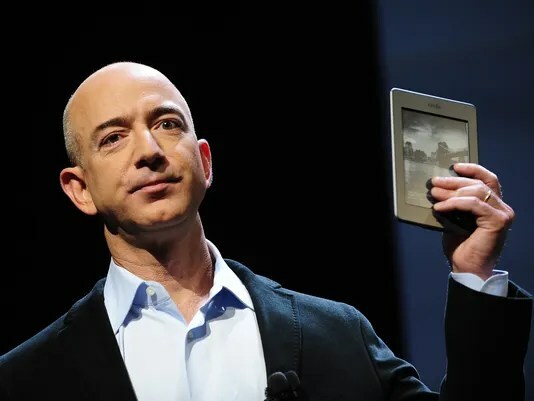 Amazon founder Jeff Bezos has done a number on brick-and-mortar retailers, defied Wall Street for years in eschewing profits for growth, taken on Apple in tablets and now holds a new title: newspaper owner. Amazon’s CEO agreed to acquire The Washington Post for $250 million today. The 49-year-old Bezos — who is famous for a honking laugh and gregarious nature — is No. 19 on Forbes‘ list of the world’s richest people, with a net worth of $25.2 billion. Bezos started Seattle-based Amazon in 1994 as a bookseller and rapidly expanded its categories and has swallowed many more. Bezos is not the first billionaire to become a major media player. AOL founder Steve Case merged AOL with Time Warner. Facebook co-founder Chris Hughes picked upThe New Republic. And IAC/InterActiveCorp CEO Barry Diller bought Newsweek, which ceased printing last year. Given how troubling advertising has been to publishers, Bezos has his work cut out. “The Internet is transforming almost every element of the news business: shortening news cycles, eroding long-reliable revenue sources, and enabling new kinds of competition, some of which bear little or no news-gathering costs,” Bezos said in a letter to Washington Post staffers. One of his interests is space exploration. He captured the public’s fascination with his startup Blue Origin, a “human spaceflight company,” with a goal of developing space hotels, amusement parks and colonies for 2 million to 3 million people orbiting the Earth.